SPW053586 SCOTLAND (1937). 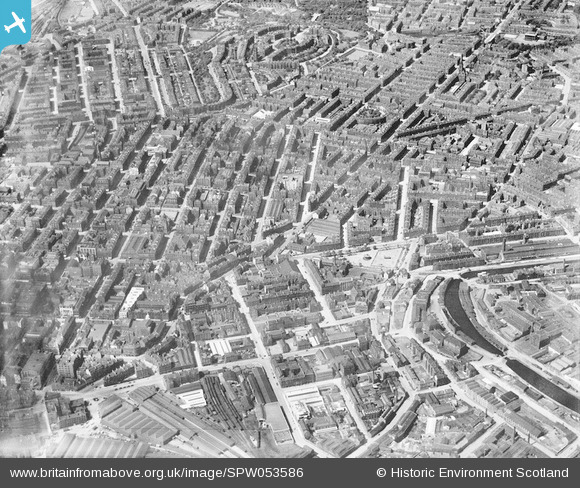 Glasgow, general view, showing Cowcaddens Road and Park Circus. An oblique aerial photograph taken facing west. This image has been produced from a print. Title [SPW053586] Glasgow, general view, showing Cowcaddens Road and Park Circus. An oblique aerial photograph taken facing west. This image has been produced from a print. As mannidaze says, and image of the very same. SS "Gipsy Queen", Forth & Clyde canal cruises to Craigmarloch. Entered service 1905, withdrawn 1939 and scrapped 1940. There has been a pub on this site since at least 1875 owned by Wine & Spirit Merchant James Dewar, he also had pubs at 48 Commerce Street, 227 Cowcaddens, 225 New City Road, 27 West Russell Street and 247 Duke Street. In 1897 Robert Wilson Armstrong acquired the licence, when Robert passed away his wife Jane took over the business. The family continued in this Gushet bar until the late 1950s, Matthew and Robert were both licensee. In 1960 Ronald Williamson took over the licence as trustee, he also took over the old pub at 3-5 Greendyke Street at the Glasgow Green for the late Joseph Anderson. The old Gushet Bar was used by students in the early part of the 70s and was finaly demolished when the Cowcaddens was raided by the bulldozer's in the mid 1970s. 51 West Princes Street, (formerly 15 Queens Crescent) scene of murder in 1908 of a wealthy 82-year old lady, Miss Marion Gilchrist, who had been living a quiet life with her one young maidservant, Helen Lambie, in a large 1st floor flat at 15 Queens Terrace, West Princes Street. She was murdered shortly after 7pm on 21st December 1908 after Helen had gone out to buy the evening newspaper and do a few errands. She was found bludgeoned to death in the dining room. Green's Playhouse, 112 Renfield Street. Opened in 1927, the Playhouse operated until the 1970s, a decline in audience numbers in the 1960s necessitated diversification as a music venue until closure in 1973. The building continued in use as The Apollo, after being acquired by Unicorn Leisure on a lease-holding arrangement, until final closure in 1985, with subsequent demolition in 1987. "The New Savoy" Hope Street / Renfrew St. Opened as a music hall in December 1911, Sold to Gaumont, 1927. Modernised, August 1934. Closed in September 1958, the building was converted to the Majestic Ballroom. The ballroom closed in January 1972, and the building was demolished to make way for the Savoy shopping centre. Lyon St. To mark the fallen from this small, cramped street, a detachment from the nearby Maryhill Barracks would march down Garscube Rd on November 11th each year.The last post would be sounded, a lone piper would play "Flowers of the Forest" and a plaque marking the dead would be brought out from the Garscube Bar. Although this ended at the start of WW2, there is a replica plaque in a local primary school and another in Woodside Library. Metropole Theatre on St George's Rd. Formerly known as the Falcon (briefly) and the Empress.Building demolished in the 1990s.